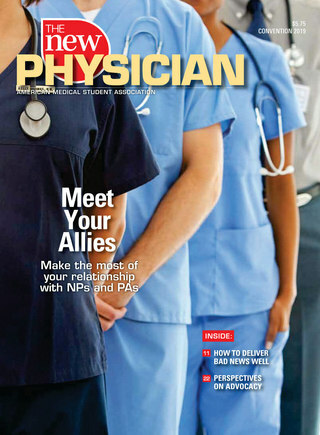 The New Physician is a bi-monthly magazine committed to exploring the social, political and ethical issues of health care and medical education. It is a journalistic publication that covers aspects of the personal, clinical and career development of physicians in an engaging but concise way. The magazine’s goal is to provide medical students with the tools they need for success in their classrooms, labs and on the wards. The New Physician‘s Student Editor and Editorial Advisory Board members help staff plan strong magazine stories for our readers. Click here to learn more. There are many ways to get involved. See here for ways to contribute to the magazine. Don’t currently receive The New Physician? See here for subscription services! The March-April 2017 issue of The New Physician was selected as a winner in the the Thirtieth Annual Awards for Publication Excellence Competition, or the 2018 APEX Awards. The APEX Awards are an annual competition for publishers, editors, writers and designers who create print, Web, electronic and social media. Business, nonprofit, agency and freelance communicators can enter APEX to win awards for their best writing, publications, campaigns, programs, design and media. Communications Concepts, Inc. sponsors the APEX Awards, and advises professionals who write, edit and manage business communications, on best strategies and practices.